The original Dungeon Defenders was a co-op focused action tower defense game that was incredibly successful for its small team of developers, selling over a million copies since its December 20, 2011 release. Now Trendy Entertainment is back with a sequel and while it will include an updated cooperative defense mode like the original, the big news is that it’s going to be Free-to-Play with plans to include a whole new MOBA mode. 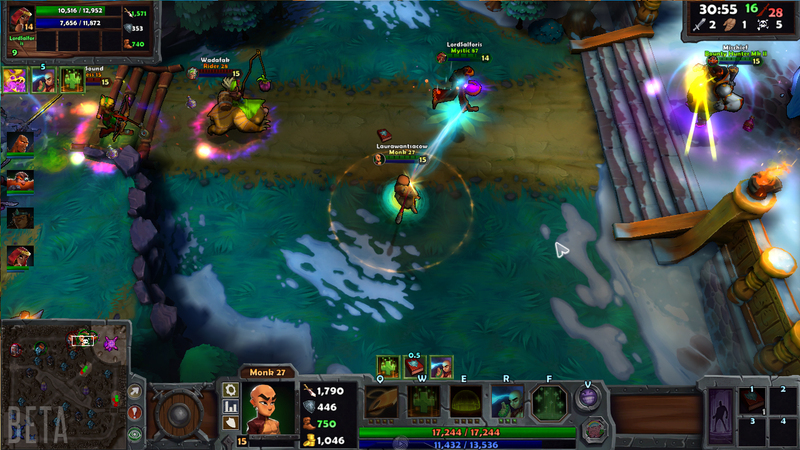 What’s more the MOBA mode is in closed beta right now and will be playable at PAX East this week in Boston. Oh and did I mention it’s being released on PC, Mac, Linux, iOS and Android? Because it will be. Dungeon Defenders 2 seems to be taking a League of Legends route with the MOBA portion of the game (which is completely separate from the tower defense), offering purchasable heroes and a weekly rotation of free ones to choose from. The devs plan on having a total of 24 playable heroes at launch with more added shortly after. Like most MOBAS, Dungeon Defenders 2 will offer the standard tri-lane map with towers and a base to be destroyed. During the development of Dungeon Defenders we constantly tried different multiplayer modes. Deathmatch, Capture the Flag, you name it. None of them really fit. When planning the sequel, we couldn’t drop the idea that a MOBA in the Dungeon Defenders universe would rock. Maybe it was all the after hour games of League we played in the office. We don’t know. But it fit well into the storyline and achieved a core goal of helping Dungeon Defenders players meet new players, so we went all in. Our take on the MOBA genre is more rpg-esque, with more hero customization, persistent hero leveling, loot and a town square where players can socialize, manage their heroes, shop, trade, and queue for matches. We’ve drastically simplified the item system, to reduce the learning curve for new players and are aiming for shorter total match times. We’re also experimenting with some other unique twists that you might find out about later (if they work!). So it looks like DDII’s MOBA will be taking the focus away from buying items and instead opting to focus more on -what I will assume to be- the ability to customize a hero’s abilities or individual stats. Of course not! As of this moment in development, everything sold in the game is obtainable through play. Furthermore, all stat giving items are awarded only through play, not pay. Like many other games in the genre though, you will be able to purchase boosts that will let you level faster or find better cosmetics. As always developer hype is one thing and if recent games have taught us anything (I am looking at you SimCity), no matter how awesome a dev says something will be we should always reserve judgement until its release. I mean what developer would come out and say “yeah we are P2W”? At least we wont have to wait long for our first glimpse at gameplay. Trendy plans on showcasing some early footage of the new mode this Friday. You can sign up for a chance at beta access by visiting the official site here. In the “Pay to play Heros unlock” section. One of the reason why I did not decide to play certain games. Well the only problem in MOBA games is the lag issues, especially for us playing at SEA region. Unless they make SEA servers that would be really great. I like that they are trying something new while not giving up on the old school stuff. If anyone knows if there are forums yet please tell me because I have an idea for a gamemode they could try. Will check the game out but, honestly there MOBA concept just sounds…terrible. Terrible and gutted, if not mutilated. Other than, seems like it could be fun. Will it be released on Steam again? I hate having games installed everywhere on my computer. DD1 whas amazing in ipad, but i tried moba’s on samsung tablet and ipad, i didnt work out too well, i hope they make smooth controlls on the android and ios devices. And for pc i dont really think anyone would play it, there are better moba’s out there (DOTA 2 ) , but im pretty sure evrybody will download it on ios/android . There are not alot of good games for phones, ipad,tablet etc. Should I give u a cookie then?